BELIZE CITY, Fri. June 17, 2016–“My party and I have done everything possible to work with the government in a bi-partisan effort. Regrettably, this effort has become a partnership of convenience by the UDP administration. That is why I have decided that until the government is prepared to work with us in a meaningful partnership on this issue, we will not attend the talks in Washington, DC, next week Tuesday,” John Briceño told reporters today, Friday. The Leader of the Opposition People’s United Party was speaking to reporters at a press briefing at the party’s Independence Hall headquarters, where he explained the PUP’s position on the next round of bilateral talks with Guatemala. “We are demanding from the government, that they send a very strong diplomatic note to Guatemala and copy it to the Organization of American States, demanding that the Guatemalan Armed Forces remain on their side of the Sarstoon River,” Briceno went on to say. 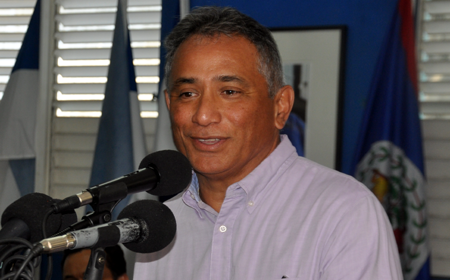 Briceño added, “We are also disappointed that the UDP Government, despite a letter that I wrote to the Prime Minister explaining the importance for the PUP to be at a meeting of the OAS General Assembly meeting in the Dominican Republic, chose not to take a bipartisan approach, to that meeting. “In fact,the resolution deals with restricting our efforts to bring or to inform the international community about Guatemala’s illegal annexation of our portion of the Sarstoon,” Briceno noted. Briceño said that while the UDP administration was negotiating a resolution, and talking about peace in the Dominican Republic, the Guatemalan government was continuing their illegal activities in the Sarstoon, and turning back Belizeans from visiting our territory. “It seems that the Foreign Minister was hoodwinked by Carlos Raul Morales, the Guatemalan Foreign Minister. Because, unfortunately, what is happening to us, I believe, is that our Foreign Minister goes to great lengths to point out that he and the Foreign Minister of Guatemala are such great friends, and he goes to such great lengths to be nice and courteous and almost being careful on what message he wants to say so as not to offend The Foreign Minister of Guatemala,” Briceño said. “We in the PUP demand that Guatemala respect our territory and immediately stop their armed forces from entering Belizean waters. We categorically reject Guatemala’s illegal annexation to the Sarstoon. We call on the government for the appointment of a national team that will deal with the Belize-Guatemalan differendum. The national team will have three objectives: 1. coordination, 2. develop a cohesive strategy in dealing with this issue, and 3. internationalize Guatemala’s illegal tactics and behavior,” Briceño explained. In the question and answer period which followed, Amandala asked the PUP Leader whether Belize is placing too much reliance on the OAS to resolve this issue of the Sarstoon. Briceño said it is not a question of placing too much reliance on the OAS. “We, as a government, are not preparing ourselves as to how we are going to deal with this issue, be it at the OAS, be it at the UN, be it at CARICOM or be it in any forum. We in the PUP have some of the best minds in dealing with this issue,” he said. “The resolution says nothing about Guatemalan aggression. It says nothing about Guatemala’s annexation of the Sarstoon. There are two very important points that the Foreign Minister fell asleep or overlooked. Something should have been said in the resolution about Guatemala’s behavior,” Briceño said. Foreign Minister, Wilfred Elrington, and Guatemalan Foreign Minister, Carlos Morales, are scheduled to discuss mechanisms to govern the two countries’ access to, and use of, the Sarstoon River. The meeting is being brokered by the Organization of American States and comes on the heel of bilateral meetings in Istanbul, Turkey, after which the Belize Government erroneously announced that Belizeans have untrammelled access to navigate the Sarstoon River. That position, however, was quickly denied by Guatemala, who asserted that the Sarstoon River is an integral part of its territory.